IEEMA, Indian Electrical and Electronics Manufacturers’’ Association, is the apex industry association of manufacturers of electrical, industrial electronics and allied equipment in India. The association member companies have contributed to more than 95% of power equipment installed in India and have a combined turnover of $ 45 Billion. India and many other developing countries are expanding and improving their distribution network to supply 24x7 power to their citizens. Growth in load and distributed generation brings new challenges for distribution network. Utilities are also deploying state of the art technologies to improve quality and reliability of supply and also reduce losses. These challenges can be overcome only with the amalgamation of electrical equipment and digital network technology. 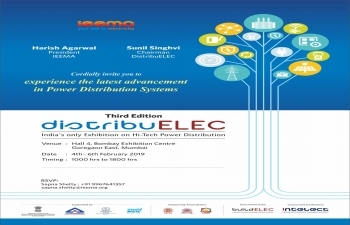 IEEMA is organizing DistribuElec – India’s only exposition on Hi Tec Power Distribution – from 4th – 6th February 2019 at Bombay Exhibition Centre, Goregaon (E), Mumbai. DistribuElec 2019 is a uniquely designed concept to bring Utility, Consumer, Electrical Operational Technology (OT) and Information Technology (IT) on same platform to empower all stakeholders. It is India's only exposition on Power Distribution showcasing products, technologies and services from 220V till 33kV in traditional electrical equipment like transformers, cables, capacitors, switchgears, meters, insulators, conductors and new age technologies in distribution automation & control systems, energy efficiency, demand response, advanced metering, communications technologies, cyber security, electrical fire safety and more. The show will attract a host of serious decision makers from across all segments to source new and innovative product and service solutions, stay in touch with the latest trends, network and do business. Buildings being the major consumption center of electricity, this event will be an exclusive platform for exhibiting conventional and smart electrical technologies and equipment to make buildings more safe, efficient and intelligent structures. Intelect 2019 is a concurrent conference in its 3rd edition with theme of “Towards Smart, Reliable, Efficient and Safe Electricity”. 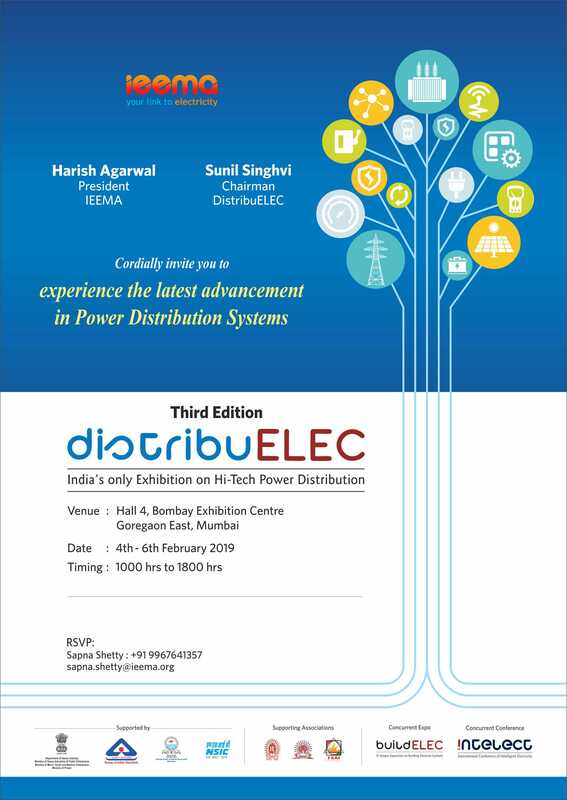 DistribuElec – India’s only exposition on Hi Tec Power Distribution is scheduled from 4th – 6th February 2019 at Bombay Exhibition Centre, Goregaon (E), Mumbai.